Our latest addition to our product offering (if you haven't noticed) is wallpaper. Created by artists that also design wall decals, they provide one more way to drive home a specific room theme. Aside from the great patterns and colorful themes, it is made of a polyester cloth that is vibrant and durable. There are also some other great features mentioned in the previous post, like no VOC's and is flame retardant. 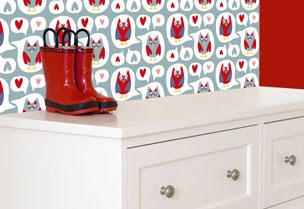 For the whole kids wallpaper collection visit our site.